Gnarly River: Day -61 : Canada here I come! Time is so odd. In any given moment it seems to stand still, yet when you look back it's hard to believe that much time has past. My last post was seventeen days ago, hard to believe. In less than two months I will set off on my epic adventure. Five months of hardship, deprivation, heat, cold, dirt, blisters, snakes, scorpions, bears, mosquitoes, wet feet, freezing nights, broiling days, cooking food over a small stove, sleeping on the ground. Why am I so excited? My wife Kelli considers it torture, she has zero interest in going with me, and there is a part of me that thinks the other part of me might be a little crazy. I have created packing lists for each of my resupply boxes so as to not miss the important stuff. Then I created a shopping list based on the packing lists. I realize that I will probably get tired of eating some of the stuff on the list, so I will only be buying enough food to get me to Kennedy Meadows. I plan on re-adjusting my menu / packing lists when I get to Mojave. My first interaction with the Canadian government was a success. They have issued my APPLICATION FOR ENTRY TO CANADA VIA THE PACIFIC CREST TRAIL. They were obviously shouting when they saved the file as the file name is in all caps. I printed it out and vacuum sealed it in a bag to keep it dry. Yay! I can enter Canada without getting arrested by the Mounties! "*NOTE: You must PRINT this approved - APPLICATION FOR ENTRY TO CANADA VIA THE PACIFIC CREST TRAIL form and keep it with you at all times while entering Canada and within Canada on the PCT. As secondary option, you may keep your attached electronic approved form in your cell phone." I love the Canadians, they are so much more flexible about things. 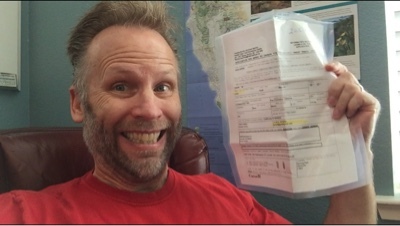 California requires that I print and have in my possession a paper copy of my Campfire Permit and the US Government requires that I print and carry my thru-hiker permit. I have to have and carry my Passport too, so I put my printed copy with my Passport in a waterproof bag and put it into my Steheken resupply box. I have also been practicing creating videos on my iPhone. I am hoping to be able to post them from the trail, but that is going to depend a lot on cell coverage and if I can get access to wifi at my town stops. I also created a you-tube channel and posted a few of my videos there. You can subscribe to it here: www.youtube.com/channel/UCVOV83PORPIbjJ6da8Be2ug that way you'll be notified everytime I post a new video. Shelly and I made a promo video a few weeks ago. I hope to have it posted to my channel in the near future.